Jordan’s King Abdullah II on Saturday hit out at those on the Israeli right who say that a Palestinian state already exists and that it is located in Jordan, Army Radio reported, citing an interview the King gave to the Al-Hayat newspaper. The King said that anyone who thinks that Jordan is Palestine is living in an illusion. "The Israeli extremists are misleading when they say that the Palestinian lands should be emptied and that the Palestinians should be exiled to Jordan," he told the newspaper. “Over the years, since the signing of the peace treaty with Israel, Jordan has adhered to attitudes and policies that support the Palestinian people and their continued existence in a country of their own,” said King Abdullah. There have been many calls on Jordan to accept the so-called “Palestinian refugees”, considering that the areas liberated by Israel during the 1967 Six Day War were under Jordanian control. 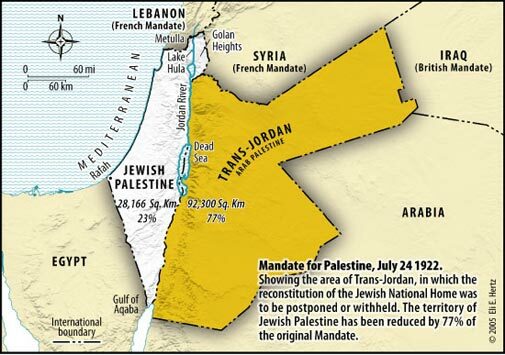 More importantly, since a majority of Jordanians - which was established in 1947 on 77% of the British Mandate of Palestine - are Palestinian Arabs (some 70%), some have suggested the country should rightfully serve as a Palestinian state. This idea has been supported by many Israeli nationalists, one example being former MK Aryeh Eldad, who has been advocating for this for years. As peace talks between Israel and the Palestinian Authority have continued, there has been growing concern in Jordan over U.S. Secretary of State John Kerry’s proposed framework agreement and what will be its effect on Jordan. Jordan's government is hoping to be spared by a popular uprising by having the repressed "Palestinians" removed and sent to Israel as part of a future deal. Jordan’s Foreign Minister, Nasser Judeh, recently reiterated that Jordan will not be an "alternative home for anybody."